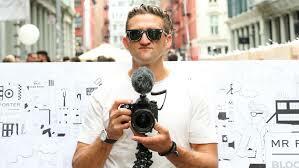 Casey Neistat came from humble beginnings and, through filming, he found success. You’re seventeen, just dropped out of high school. You’re going to be a father soon and for three years, you and your ‘family’ will live in a trailer. That was Casey Neistat’s life before he decided to move to New York City. It’s not what you think, Neistat didn’t just suddenly become a renowned filmmaker by moving to New York City. When he first moved to the Big Apple, Neistat was in the kitchen of a seafood restaurant, washing dishes. Neistat primarily gained international attention after posting a video on September 20th, 2013 entitled “iPod’s Dirty Secret,” which contains his criticisms against Apple and their lack of a battery replacement policy. Numerous news stations such as The Washington Post and BBC News caught wind of the video and wrote articles, essentially concurring with Neistat’s criticisms. Apple released a battery replacement policy on November 14, 2013. Neistat would go on to create film projects with his brother, such as the “Science Experiment” and HBO’s “The Neistat Brothers” before uploading a YouTube video. Some noteworthy vlogs are “SNOWBOARDING WITH THE NYPD,” which opens with Mayor De Blasio declaring the roads closed then cuts to Neistat snowboarding through the streets of Manhattan, and “THE $21,000 FIRST CLASS AIRPLANE SEAT,” where Neistat reviews Emirates Airlines’ first-class seat that’s worth 21,000 U.S. dollars. The former garnering 18 million views and counting, while the latter is reaching towards 60 million views. He’s praised by both supporters and critics for his innovative editing and the substantial amount of effort he puts into his videos, which he dubs as ‘movies.’ Neistat uses at least two cameras in each vlog, typically a vlog camera and a drone. The way the videos are filmed and edited, from the camera placement to the swift transitions, conveys the amount of dedication Neistat possesses regarding releasing good content. The content in each vlog varies; from a travel vlog to his life in NYC. Currently, Neistat is working towards the completion of his new company, 368, which he plans to utilize as a creative center for YouTube creators. Earlier this year, he reached 10 million subscribers, which YouTube labels as a milestone by delivering the achiever with a diamond play button. With his 989 videos, he has amassed approximately a whopping 2.5 billion views and doesn’t plan to stop anytime soon, following his motto Do More, Work Harder. I write for the Arts and Entertainment section of the Edison Light due to my fondness for trying new things and going on adventures. Whether it’s in the city or right here, in Queens. I look forward to keeping you up to date on the recent developments in the arts and the latest entertainment hotspots!